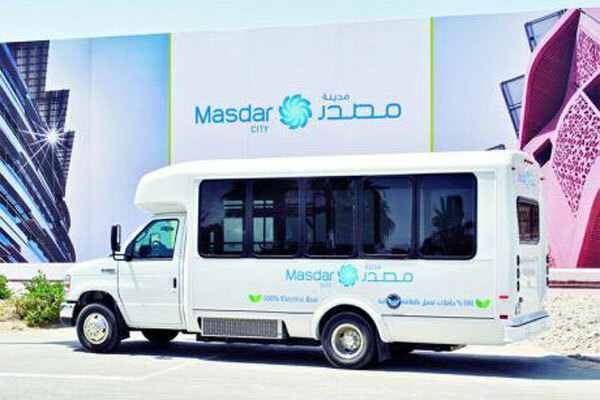 The vehicle will serve a six-stop route between Marina Mall, Abu Dhabi Central Bus Station and Masdar City, Abu Dhabi’s flagship sustainable urban community, said a statement from Masdar. The Eco-Bus will be seamlessly integrated into the DoT’s existing fleet, while the service will be free until the end of this March, it stated. The Eco-Bus has been designed to withstand the heat and humidity of the UAE climate, key performance challenges for electric vehicles. Jointly developed by Masdar, Hafilat Industry LLC of Abu Dhabi and Siemens Middle East, it seats 30 passengers and has a range of 150 km per battery charge. Solar panels are also used to power the Eco-Bus’s auxiliary systems. "The launch of the Eco-Bus is a milestone for the UAE in a number of ways," remarked Yousef Baselaib, the executive director for Sustainable Real Estate at Masdar. "Masdar City has been an incubator of sustainable mobility technologies, including the iconic Personal Rapid Transport system and the Navya Autonom shuttle vehicle. Now we are exporting solutions beyond the city limits with our partners for the benefit of the wider community," he stated. "Helping the UAE deliver on its sustainability targets, including more environmentally friendly mobility solutions, is a key part of our mandate at Masdar and high on the agenda at Abu Dhabi Sustainability Week 2019, which will showcase opportunities for further convergence of knowledge and technologies in the pursuit of cleaner and more energy-efficient transport," added Baselaib. "The collaboration between the Department of Transport and Masdar has been very fruitful and resulted in the operating of the electric bus," remarked Engineer Ahmed Ateeq Al Mazrouei, the adviser to the chairman of the DoT and head of the Buses and Water Ferries Team. "This initiative is a result of the efforts and support dedicated by DoT and its strategic partners to promote the use of sustainable and intelligent transport modes, which enhances the quality of life in the Emirate. This smart initiative is just one of a series of future initiatives that are aimed at enhancing the intelligent transportation system in the Emirate of Abu Dhabi and making it part of the daily lives of public transport users," he added. Iyad Al Ansari, the CEO of Hafilat Industry, said: "We have provided specific solutions to adapt this bus to the UAE environment and to meet the Department of Transport’s specifications." The Eco-Bus is driven by a Siemens traction system, which includes a gearless PEM motor. Highly efficient, quiet and virtually maintenance-free, the traction system has been designed to last the lifetime of the Eco-Bus, he noted. Uwe Troeger, the senior executive VP for Digital Factory and Process Industries and Drives, Siemens Middle East, said: "This technology has been proven around the world and we’re pleased to be bringing it to the UAE for local innovation in efficient, sustainable transportation."